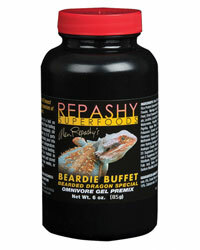 Repashy Beardie Buffet has been created, tested and perfected through several generations of Bearded Dragon breeding, thanks to work done by renowned US breeders Ron St Pierre and Heather Moye. They helped us to test and revise our recipe. Ingredients include Black Soldier Fly Larvae and fibrous plant material to produce a perfect blend of nutrients which is ideal for omnivores such as Bearded Dragons. Of course, Beardie Buffet is aimed primarily at Beardie keepers as a primary food source, but it's also a great rotational food source for many other omnivorous species, such as skinks, tegus and turtles. It is also perfect as a long-life food for when keepers run out of bugs, miss the store and need a high-quality feed for their Beardie. We hope you enjoy this great new collaboration as much as your Dragons will.